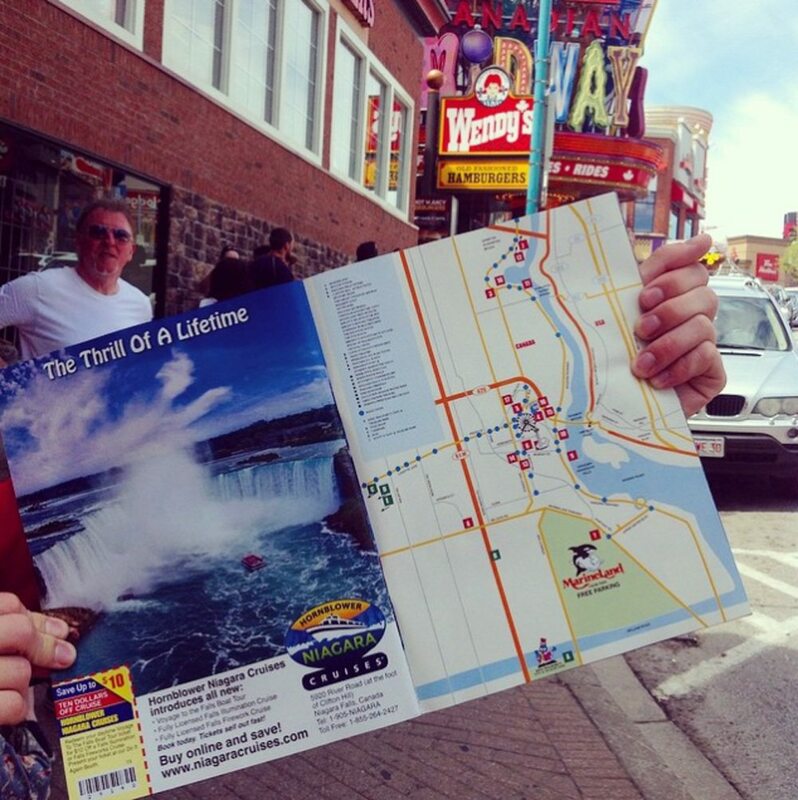 Here’s the scoop on how to get the best out of your time with the family on Clifton Hill with a few insider tips to make your Niagara Falls vacation the best time ever! Generally, the busiest times to dine during the Spring and Summer months is between 8:00 – 9:00 pm, and between 7:00 – 8:00 pm for the Fall and Winter. Our busiest season is the Summer, from the time that kids get out of school in June until the Labour Day weekend. The primary reason why our restaurants fill up at these times is due to the Niagara Falls Fireworks shows, which is one of this industry’s biggest draws to the city of Niagara. The showtimes are at 10:00 pm during the Summer, and at 9:00 pm during the Fall and Winter. Travelers prefer to dine approximately two hours before the shows begin so belly’s are full in time for the grand spectacles in the sky. Clifton Hill is a massive tourism draw for our international guests and overseas group excursions. With this in mind, many people arrive in large groups which could result in longer wait times to be seated should you come at the height of the dinnertime hour. Both the Boston Pizza and KELSEYS Original Roadhouse come equipped with a pager system should you have to wait for a table; and be aware that reservations are not made at many of these establishments (pre-planned large group bookings aside), so timing is everything. *If you wish to book a large group for parties and special functions, you may call ahead to check for availability with our Group Sales Department at 1-800-801-8557 or fill out an online inquiry here. 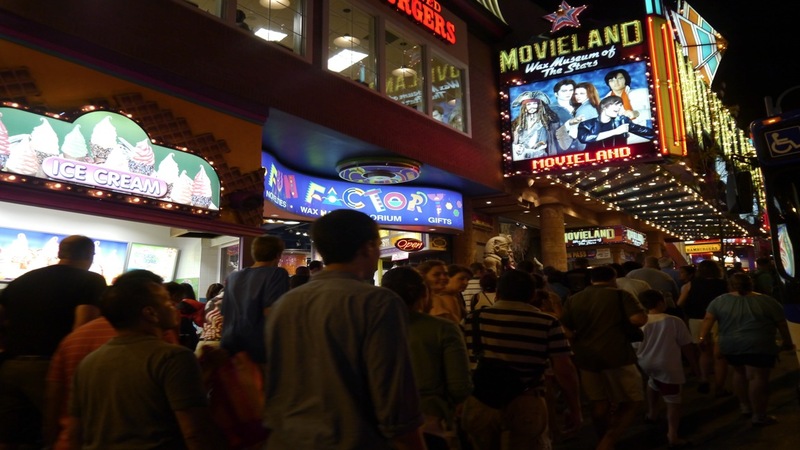 It goes without saying that when traveling to Clifton Hill in the Summer and many Holiday weekends, you should expect crowds. Once mid-April hits (or before, should the ice boom in the Niagara River be removed earlier), all the attractions will be open and running including the Hornblower Niagara Cruises and the MistRider Zipline to the Falls. Clifton Hill’s attractions run year round (with the exception of outdoor miniature golf), but with the introduction of these two seasonal tourist attractions, Clifton Hill becomes a family magnet. Hiking the gorge is at its height, Niagara-on-the-Lake is flourishing with fruit stands and outdoor patios, and events and festivals throughout the region are abound. If you can manage a getaway prior to late June, that is the prime time to travel here to avoid the peak season, and save some money along the way. Mid-week from September to March is fantastic because prices are lower for hotel accommodations. In September the weather is still warm, the boats are still on the water, both portals remain open at the Journey Behind the Falls, and kids aren’t too deep into their schoolwork yet. As long as you don’t mind large groups of school kids during the day, May to June can be heavy with end of the year school trip bookings at our attractions (see here for our current school group package for the curious minds). When referring to hitting up the attractions at the least busy times, Clifton Hill is less crowded in the mornings, as many guests are still waking up or just arriving to their hotel destinations. On days that feature the Niagara Falls Fireworks shows, many guests have the desire to try and catch the show from the Niagara SkyWheel. If this is the case, remember that you are not the only one with the same idea. The SkyWheel does not take reservations, so if the wish is to be on the ride when the fireworks go off, arrive approximately 20 minutes to a half hour before the show (even earlier on Holiday weekends). Try to do most of the Niagara Falls attractions before the fireworks shows, as once they are over, the crowds conjure up the Hill at approximately the same time. These people are ready to continue on with the fun at the same time that you are, meaning the potential of longer line-ups in likely. The Niagara SkyWheel has a standard fee of $11.99 for Adults and $6.99 for Children (plus HST) no matter the time of day, season, etc. Refer to the Niagara Falls Illumination schedule prior to an evening jaunt on the big wheel in the sky. The SkyWheel provides incredible views of the Niagara Falls and the entire Niagara skyline, but for the best photos be sure to ride within the allotted illumination times. Remember, the sky is dark by 5:00 pm in the Winter, so if you come during that time of the year, refer to the illumination chart highlighted above or simply ask a cashier working there when the lights go on and off. Without a doubt, the Clifton Hill Fun Pass is the best deal for to get more bang for your buck when doing an abundance of attractions. At an incredible savings, you’ll get 6 of our most popular attractions for only $29.95 for Adults and $19.95 for Children (+HST). During the late Fall and Winter (minus the Christmas season) some attractions can open a little later than the Summer hours of 9:00-10:00 am. If you bought the Fun Pass and you do not finish all the attractions in one day, you have one year from the date of purchase to do so. Hold on to your cards for a future visit. A huge benefit of the Clifton Hill Fun Pass is the avoidance of line-ups. Your cards are VIP, meaning you head straight to the turnstiles and scan your way in without having to wait at any cashier stations. As one of the nation’s largest miniature golf courses, Dinosaur Adventure Golf features two 18-hole courses that you choose from: “Raptor Run” and “T-Rex Trek” (for a total of 36 Holes). But what course should you choose? If your Niagara Falls vacation is family oriented and includes young children than the T-Rex Trek is for you. This course was made slightly easier, and kids will love the opportunity to play a hole inside the volcano — which only this one provides. The Raptor Run is for the competitive families or for the older family; it’s more challenging with trickier holes. Clifton Hill has an obsession with haunted houses. Which should you choose? If you have young children, stick to the haunted houses directly on Clifton Hill. While they can be scary, they are manageable. These would be “the Haunted House”, “the House of Frankenstein”, and “Castle Dracula”. Looking to terrify yourself? Nightmares Fear Factory is the one for you! Are you brave enough to make it till the end? As I write this, 148,780 have chosen to “Chicken out”. We have Clifton Hill coupons on our website available to print off ahead of your Niagara Falls vacation. These are for both attractions and dining savings. Forgot to print them off? No worries. You will find coupon books on site located in the Great Canadian Midway and our Tim Hortons location. If you park in our public parking lot (click here for information), you will receive a coupon book upon arrival full of amazing savings.